Shri Aurobinda wrote “In the district of Hooghly which is within Bengal, the heart of India, the heartbeat is heard. The district of Hooghly is indeed rich in tradition of religious practices what with its education, culture, society, history and the arts. Above all, the district is blessed and hallowed as the place of the advent and play field of the holy Lord Shri Ramakrishna. Antpur is a village situated within Jangipara police station under the sub division of Srirampur, a part of the district of Hooghly. Previously, one had to cross the village “Tara” in order to reach Antpur and the elders therefore referred to this village as “Tara – Antpur”. The Vaishnava text “Bhaktiratnakar” has a reference to this in its thirteenth Canto. Still earlier this village was known as “Visakhala” or “Viskhali”. The Vaishnava book “Vaishnabachar Darpana” has a reference to the name of Visakhala. It is said that during the Muslim rule two powerful Muslim Landlords, named Antur Khan & Anur Khan lived in Visakhala. In course of time the Jamindary of these two came to be known as Antpur and Anarbati. In this village resided the Brahmins, the Kaysthas and various other castes; the Mitra and the Ghose family here however were very ancient and particularly well known. In the temple set up by these two families, even now daily worship and various festivals are observed. Apart from agriculture, this village is very well known for its handloom industry. Like in nearby Rajbalhat, here also beautiful dhotis (male wear) and saris (female wear) are woven. The sellers bring commodities of daily use and agricultural products to the village market held twice a week even now. Now, as a pilgrimage Antpur is more famous. 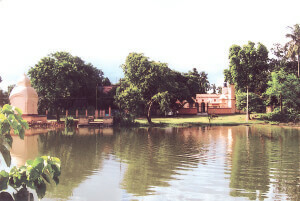 The temples with beautiful sculptures, the spacious pavilions for the worship of Goddess Durga, the Dola Mancha (to sprinkle coloured water on one another) the Rasa Mancha of Lord Krishna and the large ponds with decadent brick-built banks – all bear eloquent testimony to the glory and fame of this village in the bygone days. Lord Ramakrishna, the Holy Mother Sarada Devi, Swami Vivekananda and almost all his fellow disciples set feet on this village, thereby making it holier and doubly blessed. In this village, on the night of 24th Dec, 1886, nine intimate disciples of Shri Ramakrishna including Swami Vivekananda took the extreme vow of renouncing the world and of living the life of monks. This village has become a great pilgrimage being the birth place and play field of Swami Premananda, a disciple of Lord Ramakrishna. At the birth place of Swami Premananda, the premises of the maternal uncle’s house, a temple for Shri Ramakrishna has been built and in front of his ancestral house a beautiful and artistic pavilion for lighting the Holy Fire has been set up (Dhuni Mandap) in commemoration of the sacred vow of Sannyasa taken by the nine disciples of Shri Ramakrishna including Swami Vivekananda. 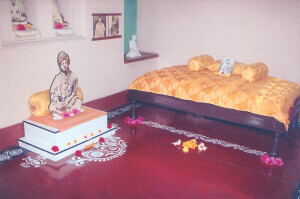 The rooms used by the Holy Mother Saradadevi and Swamiji Maharaj are preserved. The Holy Mother came to Antpur twice. First on February 5, 1889. Along with her came from Calcutta, Swamis Vivekananda, Saradananda, Yogananda, Premananda, the Venerable Mahendra Nath Gupta – Master Mahasaya and Sannyal Mahasay. After a week she went to Kamarpukur by bullock-cart via Tarakeshwar. The second time she came from Belur during the Durga Puja in 1894 A.D. The Durga Puja at Antpur (Ghosh household) was resumed that year. It was stopped for some years. The Ghosh family was deeply elated to receive the Holy Mother and Golap Maa, Yogin Maa, Santiram Ghosh (brother of Baburam) and Swami Sadananda. This house was reduced to shambles and though the efforts of RK Mission has now been brought back to its pristine beauty. Going upstairs one comes across the room where the holy mother was accommodated. Now a beautifully crafted wooden throne is adorned by a wonderful photograph of the mother. It is as if the mother is back resplendent in full glory. In the room on the right used to live MATANGINI, Baburam’s mother. An oil painting of Matangini now hangs in her room. In another room Swamiji and his fellow disciples lived in December 1886, January 1887 and February 1889AD. Baburam’s mother was peeved when Rakhal could not go in Dec. 1886. Therefore Swamiji again went to Antpur along with Rakhal, Baburam and Burogopal in Jan 1887. A young man in Antpur planned to embrace Christianity. He saw Rakhal Maharaj’s intense meditation and being impressed struck a conversation with him. He gave up his plan to adopt Christianity. Brahmanandaji went to Antpur twice; in Jan 1887 and in Feb 1922. Latu Maharaj also went to Antpur and stayed there for a few days. He did this under Thakur’s instruction. This hallowed residence of the Ghosh family rich in heritage and history stands erect. Locally this building is now known as “Mayer Bari” (Mother’s house). Matangini collected Thakur’s tooth-cleaning small stick, socks and the chappals and worshipped those with reverence. Behind this house is the pond ‘Jalahari’ said to have been used by Mother. Antpur is blessed with the footprints of Shri Ramakrishna, Shri Saradadevi, Swami Vivekananda, Brahmananda, Saradananda, Ramkrishnananda, Yogananda and others. Blessed are those who were around them. Even those that now go there for a visit go through a rich, ennobling experience. We require to make brief references to some more sites/places. Narendra Sarovar a big lake in a quiet and secluded in spot, carries the memory of Swamiji and others having their bath there. 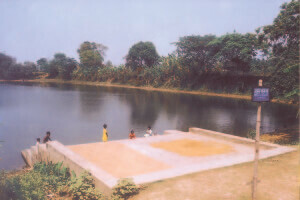 It was here that Swami Trigunatitananda who hardly knew any swimming was about to drown in this lake one day. Swami Niranjanananda rescued him Antpur High School has the proud association with Swami Brahmananda who laid foundation stone of an old block in February 1922. Parameshwar Das Thakur’s ‘Shripat’ about one km away is a sacred place for the Vaishnavas. It is one of the twelve pats. Shri Parameshwar Das Thakur was one of the twelve playmates of Lord Shri Chaitanya. He was born in a prosperous vaishnava family in Katwa, Burdwan. He was a direct disciple of Ntyananda Prabhu. When Nityananda Prabhu passed away his wife Jahnavi Devi instructed Paramshwar to preach Gaudiya Vaishnavism. Parameshwar took along with him the idol of Radha Gopinath Jiu, worshipped by Nityananda Prabhu, to Antpur and got a temple constructed where the idol was placed. The deity was renamed Shri Shyamsundara. Parameshwar Das Thakur was laid to rest here. Two Bakul trees spread cool shade on the resting place. Bakul a sweet smelling flower has intimate association with Lord Krishna. There are other temples of Kshetrapalji, Mata Sitala and Siddheshwari Kali. Many villages in rural Bengal are replete with idols of different gods and goddesses. An easy spirituality was in the air and the religion was always away of life. Now we will go to the well known ancient temple of Rajballavi Devi, recording a few words and offer our obeisance. This temple stands six kilometers to the west of Ramkrishna Math, Antpur. Goddess Rajballavi is said to be very powerful and attracts a large number of devotees from far and near. The temple is said to be nearly 750 years old having been set up by Raja Sadananda Roy who had a vision of the goddess and got the idol made according to that. Devi is larger than normal female, standing, fair- complexioned (like moon- beam). She is two handed, her right hand holding a knife and the left a human skull. Her right foot is placed on the chest of Mahakala Shiva. Mahakala again lies with the chest thrust and the hands and the feet somewhat raised. Her left-foot rests on the head of a Bhairava, known as, Birupaksha. She has three eyes, bedecked with many ornaments, a huge crown resting on her head. She wears a sari the usual wear of a Bengali female. The original temple which was completely ruined has been replaced by a new temple about eighty years ago. The mother has vegetable and fish as ‘Bhoga’ and smokes a hookah (hubble-bubble). The mother is worshipped twice daily and is known as ‘White Kali’. Reference also needs to be made to the temple of Shri Chaitanya Mahaprabhu, set up by Shri Krishnananda Puri at Dwipa. A nine day festival is held here every year during the Ratha-Yatra. It draws a large crowd. We are near the end of our journey of going round Antpur and freshening up our memory of those halcyon days when gods on earth, so to say, set their feet here. Let honey and nectar flow, let the dust of this world be enriched with kindness and compassion; let there be peace, amity and harmony. Let all the birds sing, all the rivers flow merrily and all the children be happy. Let us not for a moment forget that Shri Ramakrishna is the ultimate Truth and Reality; that his inexhaustible love always touches us and soothes us. We bathe in his love and become purer and holier.